Fifth Column are the fantastic company that print our t-shirts and bags. It’s such a dream to see our designs transform into a beautiful finished product that people can cherish! We love how Fifth Column share our ethical and environmental values, it’s so good to see an experienced company adapting so well with the current times. We caught up with Zsolt, from Fifth Column, and asked him a few questions about his company. Can you give us a little overview of Fifth Column, how you guys started and what you do? Fifth Column started in 1977 when a group of friends began designing and printing punk rock T-shirts for bands including X-Ray Spex, The Clash, The Jam and The Damned and selling them outside shows. In the beginning, we did everything by hand: the artwork was created on paper and then photographed or cut from rubylith film to make the positives, and the prints were cured at a laundrette on Kilburn High Road, where the shirts were bunged in the tumble drier for half an hour. Kentish Town, with its vibrant music scene and proximity to the world-famous Camden Market, was a natural setting for the company but after 35 years, rent increases and lack of space meant that it was time to find a new home if the business was to continue to develop and flourish so in 2013 we moved to our current 11,000 square feet premises in Tottenham Hale. There are lovely riverside walks just opposite our workplace. We are welcoming and sociable types, and therefore happy to have our clients come in and visit us. We work with many top designers and are used to having our customers on site checking out samples and discussing possibilities. QUANTITIES AND TURNAROUND: A versatile set-up that can print 20 T-shirts or 200,000 T-shirts with the same care and attention to detail, and that always delivers on time. Our normal turnaround is 7-10 working days, but we can almost always beat that if you have a more pressing deadline, like tomorrow! EQUIPMENT: State of the art machinery, printing up to twelve colours, as well as skilled hand printers for large format printing. We're proud to be official, award winning dealers of Stanley/Stella. We specialise in sourcing the widest range of ethically sourced, Fair Wear and GOTS certified garments in the UK from various other brands like Continental Clothing's Earth Positive range and Neutral to B & C and Anvil just to mention a few. All our inks our vegan friendly too. We keep all our employees on permanent contracts, and we are very proud that since 2013 we have been paying the London Living Wage! ETHICS AND ENVIRONMENT: We also offer you the peace of mind of knowing that we strive to run our business in a fair and just way, respecting people’s employment rights and caring for environmental issues. DESIGN: A professional team that can help you put your T-shirt design ideas together. SALES STAFF: Our experienced team can advise on what T-shirts to use, where money can be saved, print processes, inks etc. You will also find that, as our staff stick around, you can develop a good working relationship with us. OUR CUSTOMERS: Through these years we've been printing for all sorts of clients including brands, charities, music merch companies, sports events, breweries, fitness studios, bands, blogs, start-ups, fashion labels etc. Environment is super important to us here at Vevolution it is one of the reasons we print with Fifth Column. Can you talk a bit about why it matters to you as an organisation? Protecting the environment has always been important to all of us at Fifth Column. Environment plays an important role in the healthy living of all living creatures, it is the only home we all have, and it provides air, food, and other needs to all of us. Our entire life support system depends on the well-being of all the environmental factors and it plays an important role in regulating air and climate, another reason the environment is so important is because it is a source of natural beauty, and it is necessary for proper physical and mental health too. Screen printing is considered to be a fairly dirty industry, however there are many ways to reduce your impact on the environment. 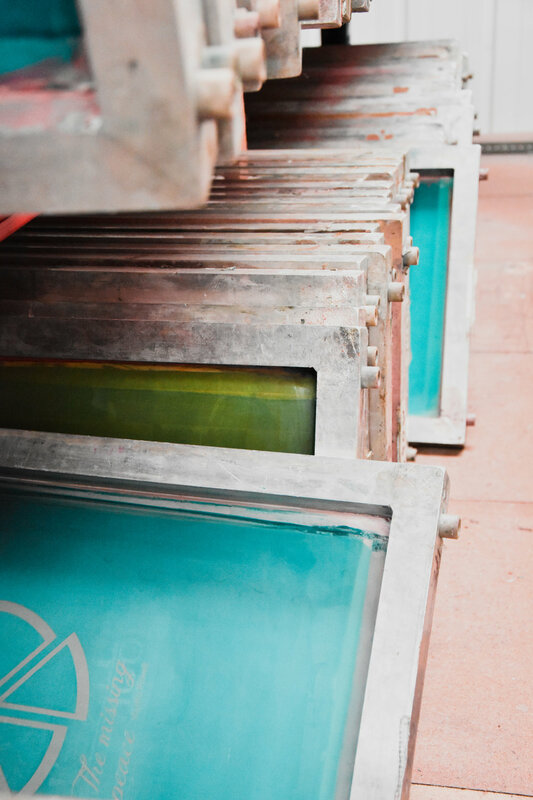 In addition to promoting printing with more eco friendly water based inks and sustainable garment options, we utilize various other sustainable screen printing processes. Our production staff continuously works towards workflow efficiency, both reducing our global footprint and increasing our production quality. Our production went paperless many years ago, using iPads instead of printed job sheets is a good for the environment and also costs less in the long term. 5 years ago we invested in a direct to screen machine so we could eliminate the use of films for making screens. This give us much more accuracy and creating close to zero waste. When choosing a new piece of equipment we always consider the environmental impact, this is why we chose a dryer certified by The Carbon Trust. We're proud to be official, award winning dealers of Stanley/Stella who is probably the most eco-conscious garment supplier, currently the 7th biggest users of organic cotton in the world! Apart from them we specialise in sourcing the widest range of ethically sourced, Fair Wear and GOTS certified garments in the UK from various other brands like Continental Clothing's Earth Positive range and Neutral to B & C and Anvil just to mention a few. All our inks our vegan and 100% phthalate free too. In 2013 we became an accredited Living Wage Employer and we keep all our employees on permanent contracts. We re-use all cardboard boxes for sending out customer orders and recycle the damaged ones, started to swap for LED lights instead of the standard light bulbs apart from many other small things in our daily lives. Fifth Column has been printing for over 40 years. In this time so many print businesses have closed why has it been you have been able to continue to thrive? Providing a great service and being consistent are key factors for building a loyal customer base. We have some customers who we've been working together with for over 20 years which is amazing. Transparency is also very important, our prices are available on our website which current and potential new customers seem to appreciate. We spend a fair bit of time in researching new technology in the industry so when it comes to making an investment we can make sure all money is well spent. Having reliable team who we can count on is also a key part of our success. Our aim is to treat our staff well and the result is loyal employees that stick around for a number of years. Fast fashion is rightly yet again in the media spotlight. What trends do you see coming in fashion that are likely to impact consumer behaviour? In the recent years we can see a real trend in customers opting for ethically sourced, organic cotton garments and we believe this will carry on for many more years to come. More and more people seem to realize that buying sustainable garments is the way to go. The overall quality is usually much better compared to the industry standard items and prints look better on them too. It's also great knowing that the workers who made the garments are paid a decent wage and are treated fairly. You guys are super supportive of us as a vegan company. Have you worked with other vegan businesses in the past? We have been working together with many vegan fashion brands, food related businesses and charities too. We believe in partnership and we're always happy give the maximum support to these businesses and we hope that together we can make a real change and less animals get hurt.